Wondering when it’s time to begin transitioning your chicks to the chicken coop? 6-week-old chickens should be ready to move from the brooder to the chicken coop if the outdoor temperature is at least 50 degrees Fahrenheit. Make the transition from the brooder to the chicken coop slowly so chicks can acclimate to their new home. Continue feeding the same Purina® complete starter-grower feed you started your chicks on until they reach 18 weeks of age. Cheers to your baby chicks growing into 6-week-old chickens! You started them strong in week 1, kept the growth going in weeks 2 and 3 and started the teenage stage in weeks 4 and 5. Your pullets and cockerels are likely ready to move from the brooder to the chicken coop. Between weeks 6 and 8, your chicks will experience rapid growth and will need twice the floor space they started with. 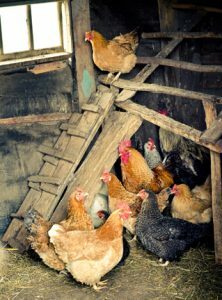 Prepare the chicken coop as the flock’s new home, paying close attention to predator-proofing steps. If outside weather is warm enough, you can now begin introducing your pullets and cockerels to the chicken coop. 6-week-old chickens should be fully feathered and can tolerate cooler temperatures. Birds can easily tolerate temperatures into the 50’s at this age, and cold-tolerant breeds can tolerate temperatures into the 40’s. Give birds a few days to adjust to the colder temperatures if they have been in a warm space prior to going outside. Maintain consistency by carrying the brooder outside and placing it inside the coop. You can also use a portable pet carrier. Set the brooder or carrier in the coop, so chicks can take in their new surroundings. Open the brooder or carrier to allow chicks to explore the coop. Make sure you show the birds the location of their starter-grower feed and water. If you are confining the birds to one part of the coop, then be sure that they have access to feed and water. If you are going to let your birds wander outside of the safety of their coop and run, they should be supervised until they are acclimated to their surroundings. Remember they are still easy prey for predators. Start with small periods of supervised free-ranging time in the garden and work up to longer periods. Maintain a routine with how and when you let the chickens free-range. Before opening the coop, offer the flock their complete starter-grower feed and fresh water. Make sure they eat their breakfast before foraging in the yard for dessert. A complete starter-grower feed should comprise at least 90 percent of their overall diet. Sanitation and biosecurity are still important. Remove manure, wet litter and old feed waste daily. Disinfect feeders and waterers weekly and occasionally clean and sanitize the coop with warm water and an appropriate cleanser. This allows you to monitor the birds closely, prevent fighting and any possible illness from spreading to either group. One way to help both groups acclimate to each other is to place the two groups in side-by-side runs. Place the groups next to one another for one week to help the birds become familiar with each other. This can also alert you to potential personality clashes that may be difficult to resolve. Another strategy is to let the new group free-range first and then introduce the existing flock. This places the focus on new surroundings rather than new flock members. In either case, add additional feeders and waterers to the run to prevent the new birds from being deterred from eating and drinking. You can also place a Purina® Flock Block® with the mature flock as an alternative place to peck. During the introduction period, a new pecking order will be established. Watch the group closely after the introduction. Content birds will continue their routines without changes in personality or feed consumption. Consistency is especially important during transitions, so continue providing free-choice, high-quality, complete feed and fresh water. Some chicken raisers ask us how long to feed chick starter feed or when to switch chicks to a grower feed. With the Purina® Flock Strong® Feeding Program, keep chicks on the same feed from day 1 to week 18. Our starter-grower feeds are formulated to provide all 38 essential nutrients chicks need from day 1 to week 18. Continue to offer the same complete chick starter feed you’ve been feeding since day 1. If you started chicks on a medicated feed, it’s important to continue feeding that same medicated feed until birds reach maturity. These starter-grower feeds are formulated to provide all 38 unique nutrients your baby chicks need to start strong and stay strong – no need to supplement with any supplements, including grit. Wait until week 18 to introduce any treats to the diet; at that time, laying breeds can also be transitioned to a complete layer feed. -Courtesy of Patrick Biggs, Ph.D. This entry was posted on Tuesday, March 5th, 2019 at 10:14 am	and is filed under chickens, News & Updates. You can follow any responses to this entry through the RSS 2.0 feed. Both comments and pings are currently closed.